This article is about the city in DeKalb County, Georgia and Fulton County, GA. For the portion of the historic neighborhood that lies in Atlanta, see Historic Brookhaven (Atlanta). "Community profile" (PDF). www.brookhavenga.gov. it is the largest city in DeKalb County. The new city stretches over 12 square miles (31 km2). Nancy's Creek furnished power for operating a mill. The place has two churches—Methodist and Baptist—one common school, and steam cotton gins. Cotton and wood form the chief exports. About 140 bales of cotton shipped per annum, most of which is carried to Atlanta by wagon. Population within a radius of 2 miles [3 km], near 400. Mail daily… Depot and station [is] one and one-quarter miles [2.0 km] distant [from] this place. Atlanta residents began constructing summer cottages in the community around 1900. In 1910, 150 acres (61 ha) on the north side of Peachtree Road were purchased for development as a planned community surrounding a golf course. The nine-hole golf course, designed by Herbert Barker, a golf pro from Garden City, Long Island, opened in 1912. Residences developed in three phases, with Brookhaven Estates designed in 1910, followed by Country Club Estates in 1929 and the Carleton Operating Company in 1936. Independently, Edwin P. Ansley sold lots in the area, calling it Oglethorpe Park. Construction of the historic neighborhood was largely complete by the end of World War II. The country club became part of the downtown Capital City Club in 1911, and its name was changed to the Capital City Country Club. The golf course was expanded from nine to eighteen holes in 1915. The clubhouse, designed by Preston Stevens in the French Provincial style, was completed in 1928. The area was incorporated as the city of North Atlanta in 1924. In 1963, the North Atlanta's leaders asked the state legislature to allow a referendum on a new city charter. The legislature agreed, but also included an additional option in the referendum: disincorporation. The majority of voters chose disincorporation, and the city's charter was dissolved in 1965. From the 1950s to the 1970s, major commercial and residential development took place in Brookhaven, resulting in the area being largely built-out by 1980. The Brookhaven/Oglethorpe MARTA Station opened in 1984. In 1986, the Capital City Club and its surrounding estate homes were placed on the National Register of Historic Places, and the neighborhood is now officially known as "Historic Brookhaven." The idea of incorporating Brookhaven as a city was first brought up in 2007, with the purpose of securing local community control over planning, zoning, land use, police, fire protection, and parks and recreation—rather than having those issues decided from Decatur. However, the idea failed to gain momentum. The proposed city would have included 53,000 people. In 2011, the incorporation of Brookhaven was revived when state Rep. Mike Jacobs announced plans to introduce legislation allowing the creation of a city of Brookhaven, over the objections of many residents of the neighborhood of Historic Brookhaven, which would not lie in the proposed city boundaries. On July 31, 2012, 55% of voters chose to incorporate the city of Brookhaven. In December of that same year J. Max Davis was elected as the city's first mayor. Historic Brookhaven: Historic Brookhaven is the historic residential neighborhood from which the area derives its name. It has homes surrounding the Capital City Country Club, many designed by a number of well-known Atlanta architects of the pre-war period. The neighborhood boundaries are well defined, and it stretches from Peachtree Dunwoody Road on the west, Windsor Parkway to the north, Mabry Drive to the east, and Peachtree Road to the south. A majority of the neighborhood technically lies within the extreme northeastern section of the city of Atlanta. Brookhaven Village: Brookhaven Village is the name given to the urban town center that has emerged on Dresden Drive, just east of the Brookhaven MARTA station, anchored by the Village Place and Village Park Place mixed-use developments. The village is bordered by the residential neighborhoods of Ashford Park to the north and Drew Valley to the south, both offering single family homes within walking distance of the village. The village is home to commercial establishments, residences, and offices. Lynwood Park: Lynwood Park was historically an African-American neighborhood of wood and cinderblock homes in the small area north of Windsor Parkway and east of Sandy Springs. In the last decade, residents seeking a new home in a close-in location have built crafstman-style homes, contributing to the overall improvement of the area's infrastructure. The community is home to a large park, Lynwood Park, which features basketball courts, tennis courts, a swimming pool, a recreation center, a playground and picnic area. Peachtree Road: Peachtree Road connects Brookhaven to Buckhead and Chamblee. Much of Brookhaven's commercial developments are situated along Peachtree, including Town Brookhaven, a 600,000-square-foot (56,000 m2) mixed-use district located at Peachtree Road and Town Boulevard, adjacent to Oglethorpe University. In addition to major commercial tenants, there are more than 1500 residential units and 150,000 square feet (14,000 m2) of office space in Town Brookhaven. North Brookhaven: North Brookhaven refers to the area that is bounded by I-285 to the north, the Fulton County line to the west, Chamblee to the east, and Windsor Parkway to the south. More specifically, the term describes the area that makes up the majority of District 1 of the city of Brookhaven. From 1924 to 1965, the area was incorporated as the city of North Atlanta, which included all of North Brookhaven as well as areas south to Peachtree Road. Largely suburban in character, the area is home to various residential subdivisions; two large parks, Blackburn Park and Murphey Candler Park, and the Nancy Creek PATH trail; the historic Peachtree Golf Club, which was founded by Bobby Jones and designed by Robert Trent Jones; and top rated public and private schools, including Marist School, Our Lady of the Assumption Catholic School, St. Martin's Episcopal School, Montgomery Elementary School, and the Kittredge Magnet School. The area also boasts two major lakes: Silver Lake (surrounded by the Brittany, Cambridge Park, and Hampton Hall neighborhoods) and Murphey Candler Lake. A restaurant and retail district, located at the intersection of Ashford Dunwoody and Johnson Ferry Roads, forms the commercial heart of North Brookhaven, occupying an area that was once known as Old Cross Keys, one of the earliest antebellum settlements in DeKalb County. Also located in North Brookhaven is Perimeter Summit, a commercial area that represents one third of Perimter Center. North Brookhaven, due to its proximity to Perimeter Center, has often been subjected to encroachment, resulting in the razing of Lake Hearn subdivision in 1989, a proposed extension of the Glenridge Connector in 1999, and the construction of a power station in 2007. 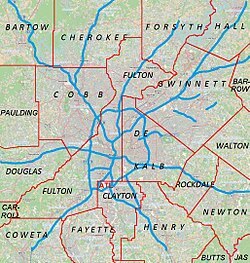 Buford Highway: The Buford Highway corridor forms the southern portion of Brookhaven. The corridor is characterized by high-density housing with a large international population, mostly comprising Hispanic immigrants. Due to its international character and ethnic restaurants and businesses catering to a variety of groups, including Hispanic, Chinese, Vietnamese, and Korean, Buford Highway has become a testament to Atlanta's growing multiethnic makeup. 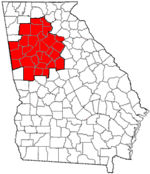 East Buckhead: A term sometimes used in the Atlanta area for what is now the westernmost part of the city of Brookhaven, Georgia. This includes areas bordering Buckhead on the east including parts of the Buford Highway corridor closest to the DeKalb County/Fulton County line, Lenox Park (DeKalb County, Georgia) and the area in between. The 2010 census counted 40,456 residents in the North Atlanta CDP. The 2000 census counted 38,579 people, 15,886 households and 7,402 families residing in the North Atlanta CDP. The population density was 5,040.6 per square mile (1,947.1/km²). There were 16,636 housing units at an average density of 2,173.6/sq mi (839.6/km²). The racial makeup of the CDP was 61.52% White, 17.56% African American, 0.41% Native American, 4.88% Asian, 0.05% Pacific Islander, 12.64% from other races, and 2.94% from two or more races. Hispanic or Latino of any race were 27.41% of the population. There were 15,886 households of which 18.5% had children under the age of 18 living with them, 33.3% were married couples living together, 7.4% had a female householder with no husband present, and 53.4% were non-families. 35.0% of all households were made up of individuals and 4.4% had someone living alone who was 65 years of age or older. The average household size was 2.35 and the average family size was 3.04. 15.6% of the population were under the age of 18, 15.2% from 18 to 24, 47.2% from 25 to 44, 15.7% from 45 to 64, and 6.2% who were 65 years of age or older. The median age was 31 years. For every 100 females, there were 121.9 males. For every 100 females age 18 and over, there were 124.2 males. The median household income was $52,333 and the median family income was $52,679. Males had a median income of $35,742 compared with $37,043 for females. The per capita income was $32,087. About 7.6% of families and 11.8% of the population were below the poverty line, including 16.1% of those under age 18 and 9.0% of those age 65 or over. Large retail centers in Brookhaven include the Town Brookhaven, a 600,000-square-foot (56,000 m2) mixed-use district on a 54-acre (22 ha) site opened in 2010, and Northeast Plaza, a 466,000-square-foot (43,300 m2), late-1950s strip mall-style shopping center on Buford Highway focused on discount and Hispanic-oriented stores. On March 14, 2017, the Weather Company, owners of the Weather Channel, announced to a group of Brookhaven Chamber members that they need more office space and will be selecting a location in Brookhaven. Colleges and universities in Brookhaven include Oglethorpe University as well Georgia State University's Brookhaven satellite campus for the Robinson College of Business MBA program. Both are located on Peachtree Road. DeKalb County School System operates the public schools serving Brookhaven. The zoned public elementary schools within the city limits and serving the city are Ashford Park Elementary, Montclair Elementary, Montgomery Elementary, and Woodward Elementary. Additionally Fernbank and John Lewis elementaries, outside of the Brookhaven city limits, serve portions of the city. Montgomery Elementary is one of five residential public schools in all of Dekalb County to exceed 90% in every CRCT category. Kittredge middle magnet school is also in the city. The public middle schools serving the city are Chamblee Middle School in Chamblee and Sequoyah Middle School in Doraville. The public high schools serving the city are Cross Keys High School in Brookhaven, and Chamblee Charter High School. Private schools include Our Lady of the Assumption Catholic School, St. Martin in the Fields Episcopal School, and Marist School. PATH Academy, a charter school, is in Brookhaven. From its opening in 1990 until 2003, the Seigakuin Atlanta International School was located on the property of Oglethorpe University. This facility is now occupied by PATH Academy. Brookhaven Innovation Academy is a public charter school which opened in August 2016. Their curriculum prepares students for a technology and information-driven 21st century. DeKalb County Public Library operates the Brookhaven Library. The City of Brookhaven is governed by a council-manager form of government. This form of governance combines an elected council composed of four members and a mayor with a professional manager who manages the day-to-day affairs of the City. The City is divided into four distinct districts with each electing a representative for the city council every four years. Councilmembers may serve an unlimited number of consecutive terms subject to their reelection. The City’s mayor is elected at large for a term of four years as well but is limited to serving two consecutive terms. The council is responsible for promoting the interests of their constituents and developing policy for the City’s administration. The council also authorizes various legislative responsibilities such as determining strategic plans, capital improvement strategy and financing, the millage rate, and approving the annual budget. Mayor- John Arthur Ernst Jr.
Brookhaven’s city manager is appointed by the Mayor and confirmed by the city council as the chief administrative officer for the City. In addition to managing and directing city staff, the city manager also performs the role of chief advisor to the mayor and council for matter regarding the City’s needs and financial standing. Ashford Park, 2980 Redding Rd. 3-acre (1.2 ha) Tennis courts, activity building, and multiple playgrounds. Blackburn Park, 3493 Ashford-Dunwoody Rd. Includes the Blackburn Tennis Center, this 49.5-acre (20.0 ha) park has tennis courts, full sized softball fields, picnic areas, large pavilion, and trails. Brookhaven Park, 4158 Peachtree Rd. 9-acre (3.6 ha) park with open use lawn area and trails. Clack's Corner, 1410 Cartecay Drive, 0.2-acre (0.081 ha). Georgian Hills Park, 2800 Georgian Drive, 7-acre (2.8 ha). Lynwood Park, 3360 Osborne Rd NE, (17 acres) park with recreation center, swimming pool, outdoor basketball & tennis courts, playground, multi-purpose field, and pavilions. Murphey Candler Park, 1551 W Nancy Creek Dr. 135-acre (55 ha) park featuring youth baseball, softball and football leagues, a 2-mile nature trail, picnic pavilions, a pool, and lake. Parkside Park, Dresden Drive, 2-acre (0.81 ha). Skyland Park, 2600 Skyland Dr., 11-acre (4.5 ha) park with open use lawn area, pavilion, and dog park for large and small dogs. Ashford-Dunwoody Road. North-south access from Interstate 285. Peachtree Road. The main north-south road which is part of Georgia State Route 141 providing access from Atlanta and Chamblee. North Druid Hills Road. North-south access from Interstate 85. The Metropolitan Atlanta Rapid Transit Authority(MARTA) provides heavy rail and bus service for Brookhaven, as well as the surrounding areas. The Brookhaven/Oglethorpe MARTA is located in the heart of Brookhaven, serviced by the Gold Line. The northern part of the city limits are within walking distance of the Medical Center and Dunwoody Station, both of which are serviced by the Red Line. Route 8 - North Druid Hills Rd. Route 47 - I-85 Access Rd./Briarwood Rd. *Route 39 leaves from Lindbergh Center and Doraville Stations, but still serves the southern part of the city. Currently, there are plans for the construction of a multi-use trail, known as the Peachtree Creek Greenway. The goal of the greenway is to provide residents with close-to-home and close-to-work access to bicycle and pedestrian trails, serve transportation and recreation needs, and help encourage quality of life and sustainable economic growth. The trail will connect Brookhaven to neighboring Chamblee. In addition, on July 25, 2017, the City Council approved a new sidewalk and bike ordinance. The ordinance mandates for sidewalks on all new and improved local residential streets in Brookhaven. Bike lanes will also be required per the recommendations in Brookhaven’s Bicycle, Pedestrian, & Trail Plan and other planning documents. ^ "Ernst Becomes Brookhaven Mayor in a Landslide". Patch.com. November 3, 2015. Retrieved April 2, 2017. ^ Bureau, U.S. Census. "American FactFinder". Census.gov. Retrieved April 2, 2017. ^ "US Census". United States Census Bureau. Retrieved August 26, 2016. ^ "USGS". United States Geological Survey. August 26, 2016. Retrieved August 26, 2016. ^ a b "Brookhaven looks at city options - Dunwoody Crier: Home". Thecrier.net. 2007-07-27. Retrieved 2013-07-14. ^ Hunt, April. "No Brookhaven, but Ashford still a possibility". Atlanta Journal-Constitution. Retrieved February 9, 2012. ^ "BREAKING: Brookhaven residents vote to create new city". ReporterNewspapers.net. August 1, 2012. Retrieved April 2, 2017. ^ "HBNA :: History of Brookhaven". Historicbrookhaven.org. 1986-01-14. Retrieved July 14, 2013. ^ "Herbert Barker – Courses Built". WorldGolf.com. Retrieved May 16, 2015. ^ "Brookhaven isn't the first city to come along here". Reporter Newspapers. November 17, 2011. Retrieved July 14, 2013. ^ "" National Register of Historic Places: DeKalb County Retrieved: 18 August 2008. ^ "Should Brookhaven be a city?". Reporter Newspapers. March 11, 2010. Retrieved July 14, 2013. ^ "Jacobs to propose law creating city of Brookhaven". Reporter Newspapers. March 24, 2011. Retrieved July 14, 2013. ^ Arnold, Stephanie L. (May 17, 2011). "Second Town Hall Meeting Scheduled to Discuss Brookhaven Cityhood - Government - Brookhaven, GA Patch". Brookhaven.patch.com. Archived from the original on 2012-03-18. Retrieved July 14, 2013. ^ "Jezebel | Modern Luxury". Jezebelmagazine.com. Retrieved July 14, 2013. ^ "Friends of Lynwood Park Archives". Reporter Newspapers. October 7, 2010. Retrieved July 14, 2013. ^ "Commercial Retail Real Estate Listings | Sembler Properties". Sembler.com. Archived from the original on 2012-03-20. Retrieved July 14, 2013. ^ "Rachel Tobin Ramos and Ty Tagami, "Disputed Brookhaven project gets lift", Atlanta Journal-Constitution, August 27, 2009". Archived from the original on 2012-04-03. Retrieved 2011-09-26. ^ Adrian Diaconescu. "District Map". Brookhaven, Georgia. Archived from the original on 2013-06-25. Retrieved July 14, 2013. ^ Yale, Christopher (2012-10-23). "Five in race for North Brookhaven council seat - Dunwoody Crier: News". Thecrier.net. Retrieved July 14, 2013. ^ "Hampton Hall". Hamptonhall.us. Retrieved July 14, 2013. ^ "Nancy Creek". Pathfoundation.org. Retrieved July 14, 2013. ^ "Links Golf Magazine | The Best Source On Golf Courses, Travel and Lifestyle: Peachtree Golf Club". Linksmagazine.com. Archived from the original on 2014-01-30. Retrieved July 14, 2013. ^ "North Brookhaven weighs new zoning cases - Dunwoody Crier: Home". Thecrier.net. 2008-02-12. Retrieved 2013-07-14. ^ "Nancy Creek ranked as 'No Excuse' school - Dunwoody Crier: Local News". Thecrier.net. 2005-04-05. Retrieved 2013-07-14. ^ "Innovative re-design above I-285 - Dunwoody Crier: Home". Thecrier.net. 2010-07-06. Retrieved 2013-07-14. ^ "Marist School". Marist.com. Retrieved 2013-07-14. ^ "Our Lady of the Assumption Catholic School". Olaschool.org. Retrieved 2013-07-14. ^ "St. Martin's Episcopal School, a coeducational Atlanta day school serving pre-school through 8th grade". Stmartinschool.org. Retrieved July 14, 2013. ^ "Montgomery Elementary School - Atlanta, Georgia - GA - School overview". Greatschools.org. Retrieved July 14, 2013. ^ "Kittredge Magnet School - Atlanta, Georgia - GA - School overview". Greatschools.org. Retrieved 2013-08-17. ^ "Old Cross Keys Marker". Static-71-126-182-50.washdc.fios.verizon.net. Archived from the original on 2013-12-30. Retrieved August 17, 2013. ^ "Must we spell it out?". TheCrier.net. Retrieved April 2, 2017. ^ "Fight on connector". TheCrier.net. Retrieved April 2, 2017. ^ "CENSUS OF POPULATION AND HOUSING (1790–2000)". U.S. Census Bureau. Archived from the original on 2010-07-08. Retrieved 2010-07-31. ^ "The Weather Company is coming to Brookhaven – Brookhaven Chamber of Commerce". BrookhavenCommerce.org. Retrieved April 2, 2017. ^ a b c "City Map" (Archive). City of Brookhaven. Retrieved on June 9, 2015. ^ "Elementary School Attendance Areas 2016 - 2017 School Year." DeKalb County School System. Retrieved on June 1, 2017. ^ "Middle School Attendance Areas 2016 - 2017 School Year." DeKalb County School System. Retrieved on June 1, 2017. ^ "High School Attendance Areas 2016 - 2017 School Year." DeKalb County School System. Retrieved on June 1, 2017. ^ "Contact Us." PATH Academy. Retrieved on April 16, 2015. "PATH Academy 3007 Hermance Drive, NE, Atlanta, GA 30319"
^ "History Archived 2005-11-04 at the Wayback Machine." Seigakuin Atlanta International School. Retrieved on January 11, 2012. ^ "SCHOOL MATTERS Former U.N. diplomat heads Japanese school here." Atlanta Journal-Constitution. July 26, 1994. C2. Retrieved on January 11, 2012. ^ "私立在外教育施設一覧" (). National Education Center, Japan (国立教育会館). January 10, 2000. Retrieved on April 16, 2015. "聖学院アトランタ国際学校 3007 Hermance Drive,NE Atlanta,GA 30319 U.S.A."
^ "Brookhaven Innovation Academy". BrookhavenInnovationAcademy.com. Retrieved April 2, 2017. ^ "Kittredge Magnet School". Dekalb.k12.ga.us. Retrieved April 2, 2017. ^ "About Us". Dekalb.k12.ga.us. Retrieved April 2, 2017. ^ "Library Locations & Hours[permanent dead link]." DeKalb County Public Library. Retrieved on February 24, 2010. ^ "Brookhaven/Oglethorpe Station". itsmarta. Metropolitan Atlanta Rapid Transit Authority. Retrieved 22 July 2015. ^ "Red Line Map: Red Line". itsmarta. Metropolitan Atlanta Rapid Transit Authority. Retrieved 22 July 2015. ^ "Route: 39 Buford Highway" (PDF). itsmarta. Metropolitan Atlanta Rapid Transit Authority. Archived from the original (PDF) on 23 July 2015. Retrieved 22 July 2015. "National Register of Historic Places Inventory-Nomination Form", December, 1985. Historic Preservation Section, Georgia Department of Natural Resources and with the National Park Service, U.S. Department of the Interior, Washington, D.C.
Brannen, Bettie. "Brookhaven History." 1991. Published in the "Neighborhood Directory," Brookhaven-Club Neighborhood Association, 1995. Maddox, Robert F. "History." published in "Governing Board; Constitution and Rules; Membership," Capital City Club, March 1992, p. 4.